Skilcraft 7530-01-578-9299 Name Badge Label - 2.33\" Width x 3.38\"
Environmentally friendly, name badge labels offer a face sheet that is made using 100 percent recycled post-consumer fiber and is processed chlorine-free (PCF). The adhesive meets the USPS specification USPS-2-1238 so it can be safely recycled. High-quality, bright white, printer labels are both acid-free and lignin-free, making them safe for archiving. Labels will not yellow. 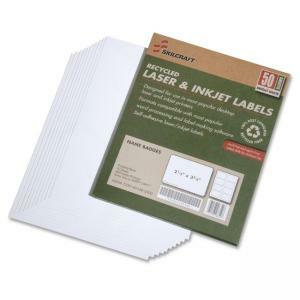 Labels are compatible with both desktop laser and inkjet printers. Each sheet has eight labels. Product packaging is made using 100 percent post-consumer percent.